simplot(mc,X) creates a heatmap from the data X on random walks through sequences of states in the discrete-time Markov chain mc. simplot(mc,X,Name,Value) uses additional options specified by one or more name-value pair arguments. 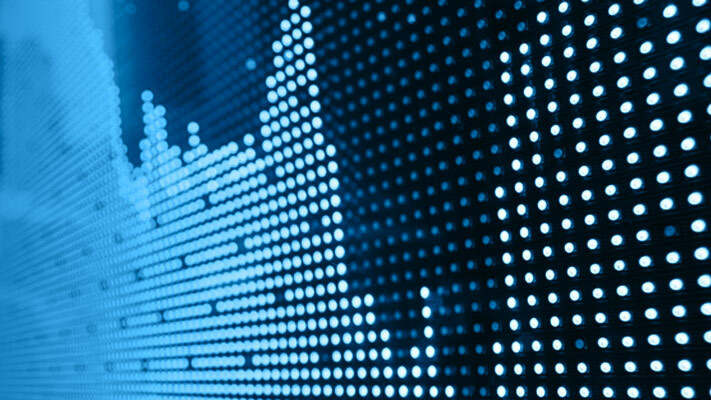 For example, specify the type of plot or frame rate for animated plots. simplot(ax,___) plots on the axes specified by ax instead of the current axes (gca) using any of the input arguments in the previous syntaxes. The option ax can precede any of the input argument combinations in the previous syntaxes. h = simplot(___) returns the plot handle. Use h to modify properties of the plot after you create it. Simulate a 20-step random walk that starts from a random state. X is a 21-by-1 matrix. Rows correspond to steps in the random walk. 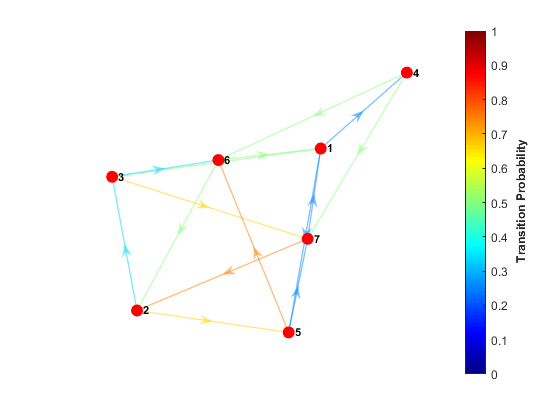 Because X(1) is 3, the random walk begins at state 3. Generate 100 20-step random walks starting from state 1. X is a 21-by-100 matrix. Visualize the proportion of times that states transition to other states for all random walks by using a heatmap. Rows and columns of the heatmap correspond to state numbers. 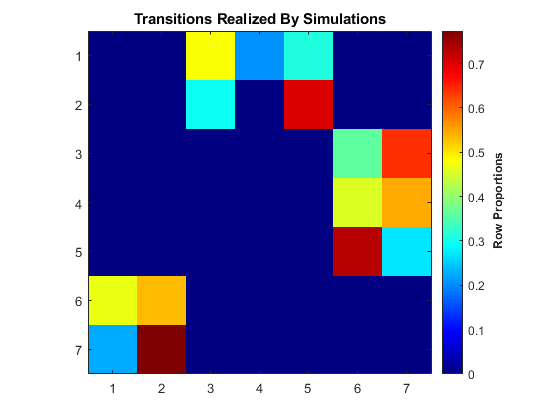 Compare the realized transition matrix to the theoretical transition matrix by using a heatmap. The realized and theoretical transition matrices are similar. Simulated data, specified as a (1 + numSteps)-by-numSims numeric matrix of positive integers returned by simulate. The first row contains the initial states. Columns represent random walks from the corresponding initial state. By default, simplot plots to the current axes (gca). Example: 'Type','Graph','FrameRate',3 creates an animated plot of the simulations using a frame rate of 3 seconds. Plot type, specified as the comma-separated pair consisting of 'Type' and a value in this table. States reached by simulations in X. The plot is a (1 + numSteps)-by-NumStates heatmap. 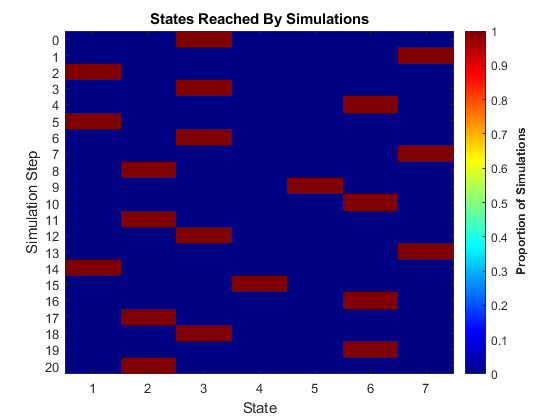 Row i displays the proportion of walks in each state at step i.
Transitions realized by simulations in X. The plot is a NumStates-by-NumStates heatmap. Element (i,j) displays the proportion of transitions from state i to state j in all simulations. The plot is an empirical estimate of the transition matrix mc.P. Animated graph of state counts (node size) and state flows (edge width) at each step. The 'FrameRate' name-value pair argument controls the animation progress. Length of discrete time steps, in seconds, for animated plots, specified as the comma-separated pair consisting of 'FrameRate' and a positive scalar. The default is a pause at each time step. The animation proceeds when you press the space bar. Handle to the simulation plot, returned as a graphics object. h contains a unique plot identifier, which you can use to query or modify properties of the plot.